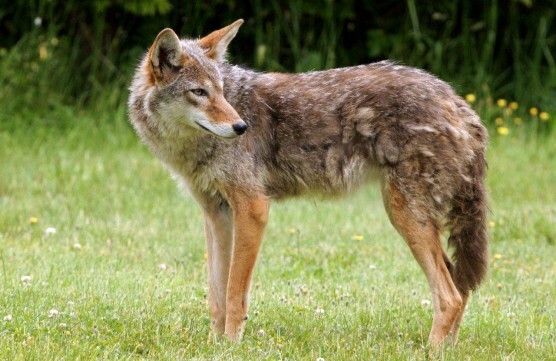 There has been a spike in reports of daytime coyote sightings over the past two weeks, especially in East Vancouver. It is difficult to say exactly what we can attribute this spike in reports to, however, the changing climate and reduction in daylight hours is altering coyotes’ behaviour to prepare for the colder winter months. That means more time spent hunting rodents, their favourite food. At this time of year, the social structure of coyote family groups are changing as well. Many adolescent male coyotes, born earlier this spring, are vying for position within their family groups. Depending on availability of food and space in their areas, they will disperse to find their own territories and possibly partners for the coming mating season. Find out more about coyotes from our Understanding Urban Coyotes page. We encourage residents to reinforce a fear of people into the coyotes through basic hazing and spreading the word about coyote awareness, and please remember to keep your cats indoors, especially at night. Thank you to all those of you for submitting your reports and we hope that you have found our coyote awareness information useful. We will continue to diligently respond and map your coyote reports so that we can further understand coyote behaviour and promote coyote awareness in your area.